The Lincoln Stars earned 3 of 4 possible points in their road series against the Fargo Force this past Thursday and Friday. On Thursday, Lincoln fell to Fargo in OT by a score of 5-4. Click here to view the Pointstreak boxscore from that game. 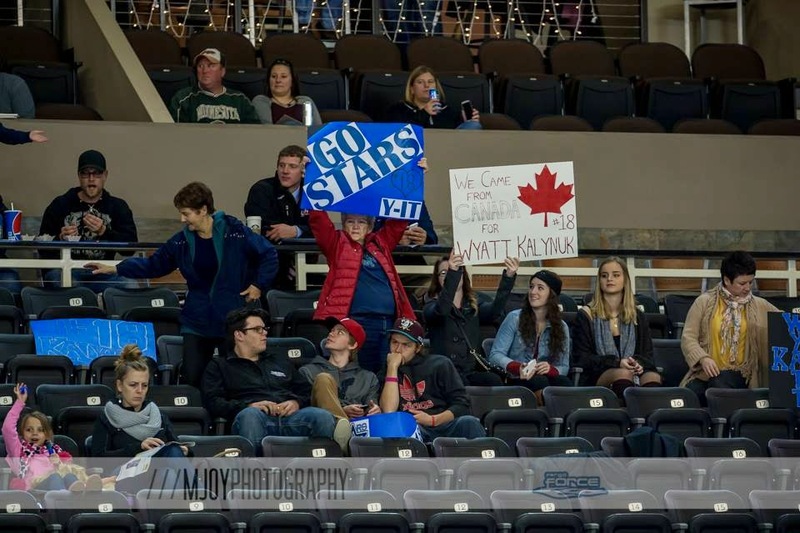 Friday evening, the Stars rebounded with a quality effort to beat the Force in OT by a score of 2-1. Click here to view the Pointstreak boscore from that game. With the OT loss and the OT win, the Stars improved their regular season record to 3-3-1 (7 points), and are in fifth place in the USHL western conference standings. Click here to see the current USHL standings. The Stars started very, very slow against the Force Thursday evening at Scheels Arena in Fargo, ND. I'm hoping this isn't a trend, but it seems like the Stars have a bit of a problem with slow starts as of late. The Force took advantage of Lincoln's bus legs and took a 1-0 lead into the first intermission. Fargo outshot Lincoln 12-5 in the first period. Another slow start in the second period put Lincoln down two goals, but the team responded with two straight goals of their own to knot the game at 2-2 heading into the second intermission. Through two periods of the game on Thursday, I'm not sure I've ever seen the Stars play that badly. I'm not piling on here, just stating what I saw watching on FASTHockey. The Force absolutely dominated every aspect of the Thursday evening game through forty minutes. Lincoln's second goal in the middle period was scored by forward Blake Christensen on an odd man rush with a great assist from forward Grant Jozefek. The picture at the top of this article, courtesy of mjoy photography, shows Christensen scoring that goal. So despite being outshot 33-10 through two periods Thursday evening, the Stars were tied with the Force at 2-2. Lincoln goaltender Cam Hackett was certainly Lincoln's MVP that night, and the next night for that matter. In the third, both teams scored two goals a piece with Lincoln goals coming from forwards Michael Gillespie and Blake Christensen (his second of the night). Christensen's second goal of the game incredibly gave the Stars a 4-3 lead, but Fargo answered later in the period to tie it up at 4-4. Stars outshot the Force 16-8 in the third period. In the OT period, Stars had a great opportunity early on with a 4-on-3 powerplay to end it, but they were not able to get the puck past Force goaltender Mathias Israelsson. A make up penalty called on the Stars later in the OT period allowed Fargo to score the game winner. I'm not sure the Stars had any business getting the game Thursday evening to overtime, but I like how they played in the third period and for the most part in OT. Cam Hackett stopped 38 of 43 shots on goal, but without his stellar play, the Stars don't get the point. On Friday evening, the Stars performed quite a bit better I thought compared to the Thursday OT loss with goaltender Cam Hackett leading the way once again. In the scoreless first period, both teams played very cautious and combined for only 10 shots on goal (five a piece). I thought Lincoln played much better defensively to start the Friday night game, which was good to see considering what I saw from the Thursday opening period. In the second, the shot total went up but goaltenders Mathias Israelsson and Cam Hackett stood tall. Fargo outshot Lincoln 15-8 in the middle stanza, but the majority of those 15 shots fired by the Force were thrown on net from bad angles. 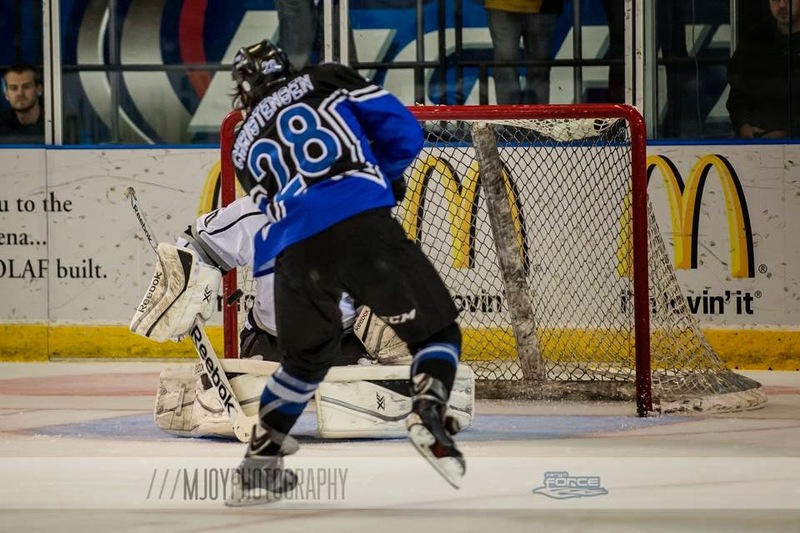 The Stars got on the scoreboard first thanks to Blake Christensen's third goal in two games. On that particular play, Christensen worked incredibly hard along the far boards to keep possession of the puck before spinning away from two Fargo players and then firing a laser past Israelsson that beat him high stick side. Just a great individual play by Christensen who was one of Lincoln's best forwards in the series against Fargo. The 1-0 third period lead by the Stars wouldn't last more than a minute as the Force answered with a goal of their own to knot the game at 1-1. A Fargo shot from the point could not be controlled by Hackett and the Stars, which turned out to be the only goal Hackett would allow in this game. Just like the Thursday night tilt, the Friday evening game went to an extra OT period. However, this time around the Stars got the game winner thanks to some great teamwork from Stars forwards Miguel Fidler and Dominick Sacco. Stars goaltender Cam Hackett stopped 39 of 40 shots on goal to rightfully earn the win. Hackett made some incredible saves in the third period to keep this game tied. Without his play against Fargo, I very much doubt the Stars get 3 points. Overall, I like how the Stars responded after the lackluster first two periods on Thursday evening. The played much better defensively and for the most part outplayed Fargo on Friday. Friday's 2-1 OT win was the first game this season in which the Stars did not surrender a powerplay goal against. There's plenty of room to improve the penalty kill, but it was nice to see the Stars blank the Force on the PP. Stars are back in action on Saturday, October 25th in Sioux City against the Musketeers. The next home game is on Halloween at the IceBox against the Waterloo Blackhawks. In a bit of a scheduling quirk, the Stars only play two games in the next 20 days. I'm proud of the boys...getting 3 out of 4 points on the road against a quality team is not easy...I agree with you yeti...the slow starts are starting to concern me...but anyways looking forward to the game next week on Halloween! GO STARS!